I have been a lover of trees for as long as I can remember. My back yard growing up was basically a section of forest. I loved being in forests and smelling the autumn leaves turning. I loved their different shapes and colors and smells. The greatest of trees it seemed were the redwoods. In my back yard growing up we had 3 or 4 dawn redwoods. These were relatively small as they were very young. I had read about the great coastal redwoods but had never seen them until in 1998 I made a trip out west. 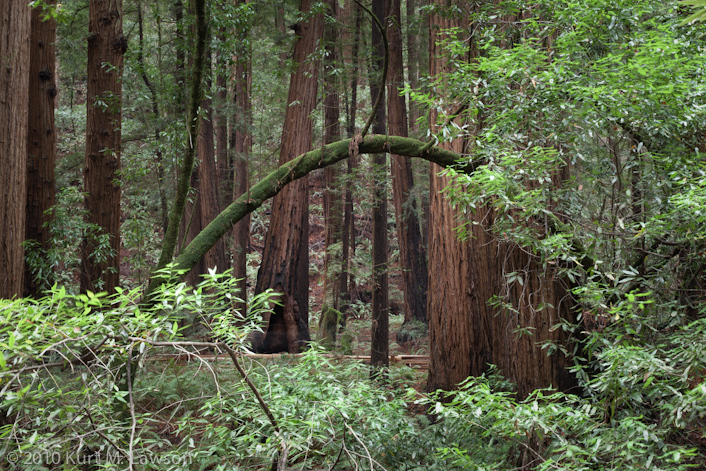 In this trip my dad and I made a stop at Muir Woods, and being a photography lover I had my Mamiya 645 with me. As we walked that wonderful grove, I made several pictures that to this day are some of my favorite photos that I have ever taken. Below is one of those images. Walking along the trail I was fascinated by these trees that will fall over and then keep growing in their new orientation, sprouting limbs straight up from the fallen log in cases. These stood and fell in the shadow of the wonderful redwoods around. This one had somehow grown into a near perfect arch and stopped me in my tracks. 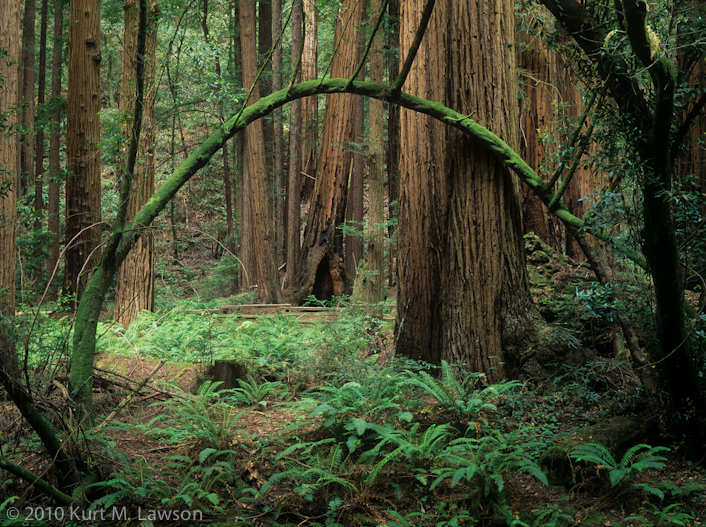 The combination of the arch with the redwoods all around was instantly a must-shoot composition. After some searching around I found a spot that seemed to minimize the impact of the wooden boardwalk in the background and emphasized the arch. This is that picture. The light was soft and beautiful, emphasizing the colors. Just recently I had the opportunity to revisit Muir Woods for the first time since that trip in 1998. I hit the loop and made my way through. We only had about two hours of light left, but I soon recognized the spot, or nearly anyway, where I had taken that arched branch photo all those years before. This time I did not have my Mamiya (I had forgotten it in the car! Next time I will not forget). Instead I had my my trusty Canon 5D Mark II which is my standard operating camera these days. Armed with cell phone service in the park I suddenly had the idea to try and take the same photo again. I had located the spot by memory, but couldn’t quite get the angle right. I called up a copy of the film image on my phone and did the best I could to get the right angle. What I got is pretty close. It’s definitely the same general position. However, you can obviously tell the landscape has changed! A whole new crop of leaves has enveloped the foreground and right side of the image. Looking at the two side by side, it seems as if the right most trunk had fallen over in the camera’s direction and then sprouted up all those branches and leaves. So, the picture I took all those years ago is not possible anymore. The foreground clutter just doesn’t give you the same effect. The arched tree is still there, growing slowly. In coming years it will no doubt look much different still. Muir Woods is a magical place to me. My first exposure to the mighty coastal redwoods. I hope everyone has the opportunity to visit the redwoods somewhere one day. Stay tuned for more images from Muir Woods as soon as I can process them!